Having a catchy blog title plays the largest role in how much traffic your blog post will get. It determines where the post will rank in Google, how many social shares the post will get, and if your email list will even take a chance on your latest featured post. The mistake that most bloggers make is spending all of their time on the content of the post and just a couple of minutes on the headline copy. The headline is the most important piece of the post. If you fail to create a compelling headline, then your great piece of content will rarely get seen or shared. Neil Patel identified the key statistic why bloggers need to focus more time and energy on headlines. Over the past three years, I have crafted over 5000 post titles. Collectively, those article titles have driven over 58 million visitors to read those posts. Are you ready to find out the statistically backed strategies I use to create top-notch blog titles every single time? Numbered titles that lead to list formatted blog posts move up the rankings faster than any other type of blog post. The reason behind this, is that people prefer to scan through the key points of articles. If they see the number 11 at the beginning of the title, then it is clear to them that they will be able to quickly scan through the eleven key points that are listed within the post. This psychological preference drives more clicks and keeps them reading numbered posts longer than the other competing Google results. Google’s algorithm recognizes this and rewards the numbered posts with higher rankings. 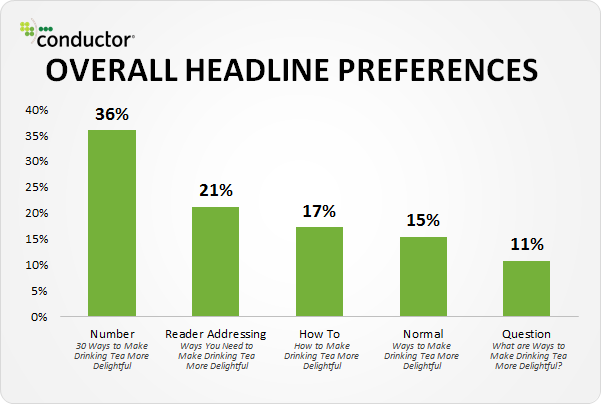 Conductor did a study on what people preferred in a headline, and the study revealed that the numbered headline was the clear winner. Although no one has yet to explain the psychology behind it, the odd numbered headline gets more clicks than the even numbered headline. 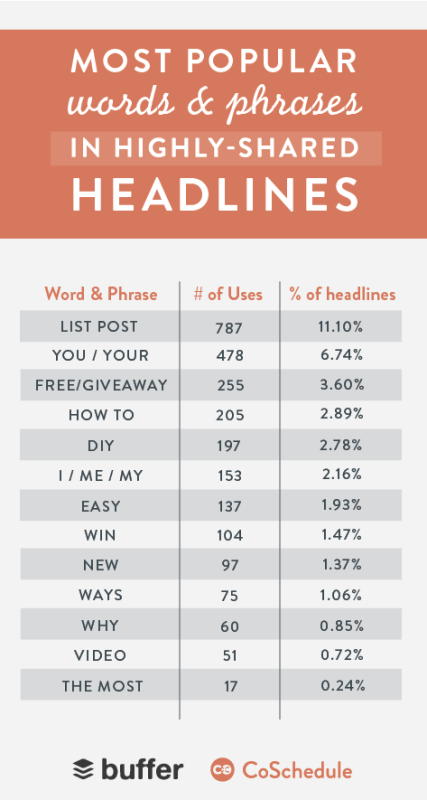 The Content Marketing Institute published the results of a study that analyzed over 150,000 of the most successful headlines on their platform. They found that the odd numbered headlines were clicked on 20% more than the even numbered headlines. One of the main reasons why numbered posts perform so well is because it leave almost no ambiguity. In all of your blog post titles, no matter what the style, aim to give the reader clarity. This means your title should tell them what they are going to get in the blog post. 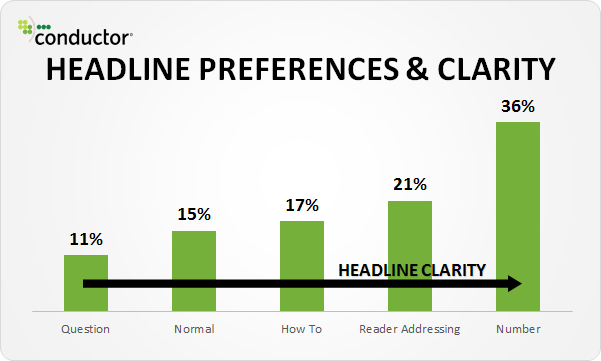 The Conductor study on headlines found that click through rates significantly increased with headline clarity. 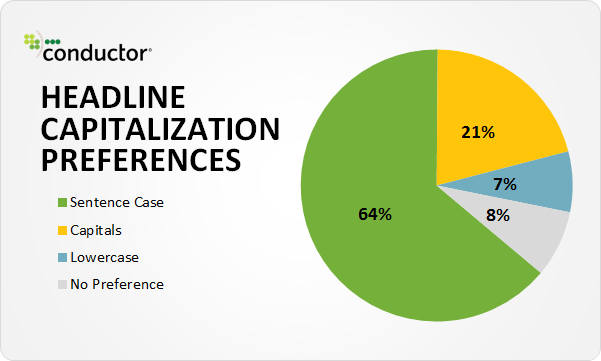 The Conductor headline study identified that sentence case is preferred 300% more than the other capitalization styles. Bare Minimum Characters – This strategy focuses on keeping all titles under 45 characters to ensure that the complete title gets read. Keep in mind that different letters take up more and less space. For example, the letter w takes up 4 times the amount of space as the letter i. If you limit the title to 45 characters, then it will only get cut off about 2% of the time. Stacking The Target Keyword Phrase At The Beginning – If you use this strategy, then you will not be bound to a character limit. Just be sure the keyword phrase that you are wanting to be seen and rank for is in the first half of the blog title. Moz studied over 28,000 titles that were on the first page of Google results for popular keyword phrases. They found that the range of post titles to be cut off was 42 to 68 characters, with the average being 57.7 characters. CoSchedule analyzed a group of different studies on headline length, and they confirmed that six words is the magic number. A superlative is a strong adjective that is placed at the beginning of the title for extra emphasis. They can give you a boost in clicks, but you want to limit yourself to one really good one in your blog title. 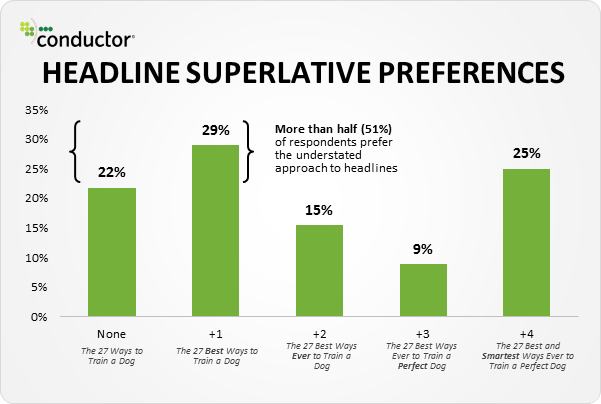 The Conductor study found that 51% of the people they surveyed preferred 0-1 superlatives in the headline. Outbrain did a study on 65,000 titles within their network to compare titles with negative, positive, and no superlative. The titles with the negative superlatives clearly outperformed the rest by 30%. Buzzfeed is widely known as the king of headlines. They have spent millions on coming up with and analyzing headlines that outperform the rest. Instead of racking your mind to come up with your own clickable phrases, it is much easier to steal a page from Buzzfeed’s playbook. Max Woolf was able to identify Buzzfeed’s most shared three word phrases. Not all of these will carry over to your blog topics, but there are at least ten all encompassing phrases everyone can use. Buffer analyzed the most shared headlines on their platform, and they found that reader addressed titles ranked second behind the list post title. Outbrain’s headline study found that pushy headlines actually decreased engagement by 20%. V3b revealed that bracketed clarifications in headlines increased the click through rate by 38%. If you have a gender specific blog focused on females, then you may want to use numbered blog titles in every 2 out of 3 posts. 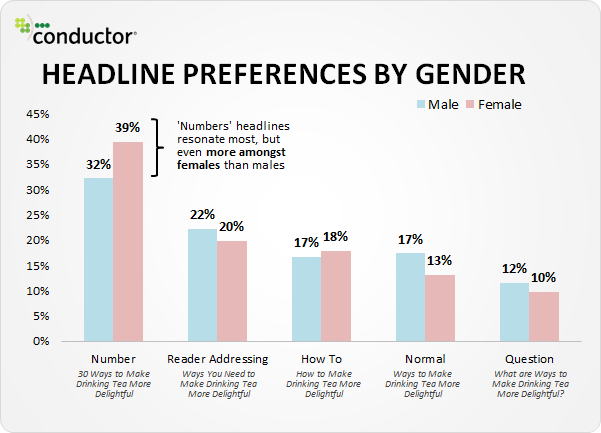 The Conductor headline survey pointed out that women prefer numbered headlines almost 20% more than their male counterpart. CoSchedule conducted a study that measured the effect of the Emotional Marketing Value (EMV) of headlines on the total number of shares a post has. The results showed that the average EMV for posts with over 1000 shares was twice as high as posts with less than 100 shares. So… How do you capitalize on this knowledge? You can start by incorporating some of the 180 power words that the famous copywriter Karl Stepp uses for emotional selling. BuzzStream identified the worst performing BuzzFeed headlines of all-time. They were able to narrow it down to 10 different styles of posts. Three of those ten were questions. The right mix of common, uncommon, emotional and power words. The ideal character and word count. A preview of how the blog title will look in Google and in email. Identification of the primary words people will read when skimming your headline. If you ever get stuck on creating a title for a specific subject matter, then take a few minutes to get some inspiration via an online title generator. Two of the best are by Portent andTweak Your Biz. Pop in your core word and you will get an endless number of potential headlines. Congratulations… You are now equipped with all seventeen strategies that I use to come up with exceptionally catchy blog titles. Be sure to take action and create the next five blog titles using the strategies and tools you have learned about today. Before you do that, please take a moment to share this post on Facebook, Pinterest and Twitter. I appreciate all of your support. Look complex to far added agreeable from you! By the way, how can we be in contact? to see articles or reviews, except this website presents feature based articles. Thanks to my dad who told me about this webpage, this weblog is truly awesome. good deal. I used to be seeking this particular information for any while. Many thanks and have a great time. Hello mates, its enormous paragraph regarding cultureand completely defined, keep it up all the time. internet visitors, its really really nice paragraph on developing new webpage. Your look is actually unique in comparison to other folks I’ve read stuff from. I am just quite sure I’ll learn many new stuff below! this webpage includes amazing and actually excellent data in support of visitors. cost you a pretty penny? I’m not very web smart so I’m not 100% certain. Any suggestions or advice could be greatly appreciated. Thanks a lot for stopping by and read our posts, for more info just send us an email or a message on Fb, we will be happy to help you with some tips. Take care. I constantly spent my thirty minutes to read this website’s content daily together with a cup of coffee. I am just uncertain where you are having your information, but great topic. I should invest some time learning more or understanding more. it’s uncommon to check a great blog like this one today..
this bit of writing provides good understanding even. Drive Traffic – AM:PMVA <Liked it! Thanks! It a astounding webpage!. new website or possibly a weblog from begin to end. up, we need work out extra strategies on this regard, thanks for sharing. Your personal style is incredibly unique as compared to other people I’ve read stuff from. Be grateful for posting once you have the chance, Guess I will just bookmark this internet site. I am truly pleased to read this website posts which contains tons of valuable information, thank you for providing these information. I simply want to say I am just very new to blogs and absolutely loved this web site. Almost certainly I’m want to bookmark your site . You surely have really good article content. Cheers for revealing your blog. Quality content will be the main to interest the users to pay a brief visit the site, that’s what this web site is providing. other than that, this really is magnificent blog. A fantastic read. I am going to definitely be back. I simply want to mention I am just new to blogging and site-building and really enjoyed your blog. Almost certainly I’m planning to bookmark your blog post . You absolutely come with perfect writings. Thank you for sharing with us your webpage. I just want to tell you that I am just very new to blogs and really loved your page. Almost certainly I’m going to bookmark your blog post . You actually come with awesome posts. Thanks for revealing your webpage. I simply want to say I am newbie to weblog and actually enjoyed you’re web site. Very likely I’m going to bookmark your blog . You actually come with good article content. Appreciate it for sharing with us your web-site. I just want to mention I am very new to blogs and definitely savored you’re web-site. Almost certainly I’m want to bookmark your blog post . You absolutely come with fantastic articles. Appreciate it for sharing your blog. I just want to tell you that I am just all new to weblog and really enjoyed your web blog. Likely I’m going to bookmark your blog post . You really have good posts. Cheers for sharing your website page. I simply want to mention I’m new to weblog and actually loved your web blog. Most likely I’m going to bookmark your blog post . You actually come with tremendous writings. Thanks for sharing your web-site. I just want to tell you that I am new to blogs and certainly loved you’re blog. Very likely I’m likely to bookmark your site . You absolutely come with fantastic posts. Appreciate it for sharing your web page. I just want to mention I am just newbie to blogging and site-building and absolutely liked you’re website. Very likely I’m going to bookmark your website . You certainly have beneficial writings. Appreciate it for sharing your blog. I simply want to say I am all new to blogging and site-building and actually savored this web-site. Very likely I’m likely to bookmark your blog . You really come with very good articles. Thanks a lot for revealing your website. I just want to tell you that I’m newbie to blogs and really liked your web site. Most likely I’m going to bookmark your blog . You really have awesome articles and reviews. Thanks a lot for sharing with us your blog.